The following post is sponsored by FitFluential LLC on behalf of Wild Blueberry Association of North America. Hey guys, happy Monday! How did the weekend treat ya? We had a really nice weekend here. Friday night was spent with our friends Joe & Kate with some Chinese take-out. Saturday morning Jay and I had a baptism class to attend (Lucas will be getting baptized next month), so he stayed home with my mom and got some grandma time. Saturday evening we had two Christmas parties to go to, which were great, and then Sunday was spent relaxing at home. Now, when I tell you I’ve been craving coffee cake for months, I’m really not exaggerating. It’s one of those things I’ve always loved, and I’ve been meaning to make one for what seems like forever, but I just never get around to it. Well…yesterday was the day. So while I got to work in the kitchen, Jay hung out with smiley. Part of my reasoning for yesterday’s coffee cake extravaganza is because I needed to come up with a recipe incorporating wild blueberries, as part of a campaign I was chosen to participate in through FitFluential. I think a lot of people – myself included – assume that a blueberry is a blueberry. But I’ve quickly discovered that this is hardly the case. Wild blueberries have a very different taste than regular blueberries and are also harvested quite differently, too. They’re grown in Maine, eastern Canada, and Quebec, and are never harvested commercially, so they’ve never been modified or meddled with. 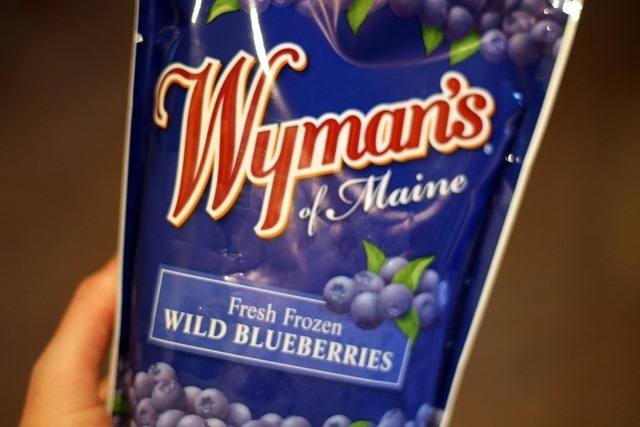 Most are simply frozen at harvest, which locks in their intense blueberry flavor and antioxidant power. And did you know that they have twice the antioxidants as regular blueberries? 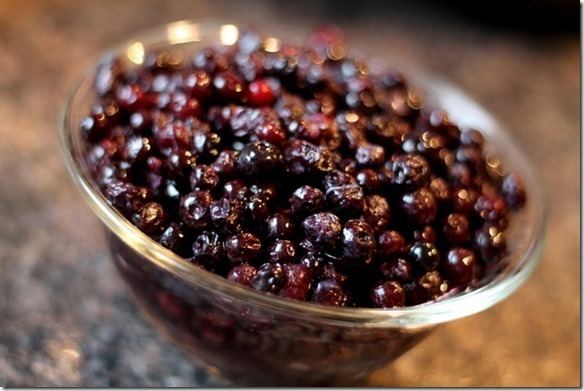 Apparently, they have a flavonoid called Anthocyanin, which gives them their deep color and antioxidant power. Who knew? Wild blueberries are also smaller, much more intense in flavor and color, and they contain less water, making them easier to freeze and bake with. I also love the fact that, since they’re mostly frozen, they’re available year-round (for the locals, I found them at Hannaford!). So, when my desire to bake once again strikes, I’ll have nothing holding me back. To find out more about Wild Blueberries, feel free to check them out on Facebook, Twitter, and Pinterest! But anyways…back to this recipe. 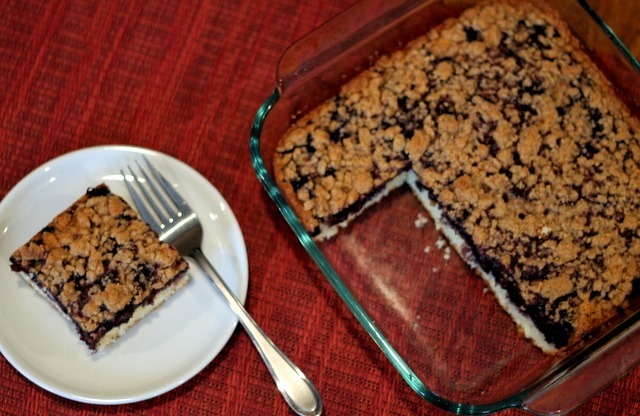 Think, subtly sweet cake, topped with tart yet sweet wild blueberries, and finished off with all sorts crumbly, sweet streusel topping. Oh yes…there was no skimping on the streusel here. Both Jay and I immediately fell in love at first bite. And honestly, I’m totally diggin’ how the blueberries wound up in a layer above the cake, rather than baking into it. I think it gives the whole coffee cake a totally different feel…but don’t just go by my word. Give it a try for yourself! Preheat oven to 350 degrees F. Spray an 8×8 baking dish with non-stick cooking spray; set aside. 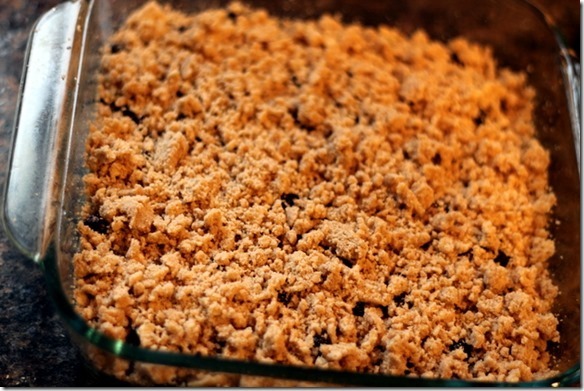 For streusel topping: In a medium bowl, mix flour, brown sugar, and cinnamon. Cut in butter using a pastry blender or fork until it resembles coarse crumbs. Set aside. For cake batter: In a separate bowl, mix the flour, baking powder, and salt. Set aside. In a bowl with an electric mixer, beat the butter and sugar until light and fluffy. Add the egg and vanilla and beat until incorporated. Add the flour mixture, alternately with the milk, and beat only until just combined. Spread the batter evenly onto the bottom of the prepared baking dish. Evenly arrange the blueberries on top of the cake batter and then sprinkle with the streusel topping. Bake for 45-50 minutes or until a toothpick inserted in the center of the cake comes out clean. Cool slightly and serve. Enjoy! P.S. – If this post started sound a bit scattered and/or full of grammatical errors, forgive me. I started writing it up right before we attempted to put Lucas down for bed in our first night of transitioning him from his Rock ‘n’ Play to the crib. And, umm, let’s just say that so far, he’s not too happy with us. I think we’ve got a long few days/week ahead of us…feel free to send me some good thoughts and sleep wishes. This looks amazing! I'm supposed to bring the dessert for a Christmas party this weekend, and this is definitely a contender now! Good luck with the sleep transition! I hope it gets easier for you!!! What a delicious looking recipe! I'm drinking a cup of coffee and right now and would love to have a piece of that cake. I had no idea that wild blueberries have more antioxidants, but I agree, they do taste better. Good luck with Lucas and his sleeping! Great to know about the wild blueberries! Thanks for the fun fact(s) of the day :) sending you wishes for a good nights sleep and a smooth week! 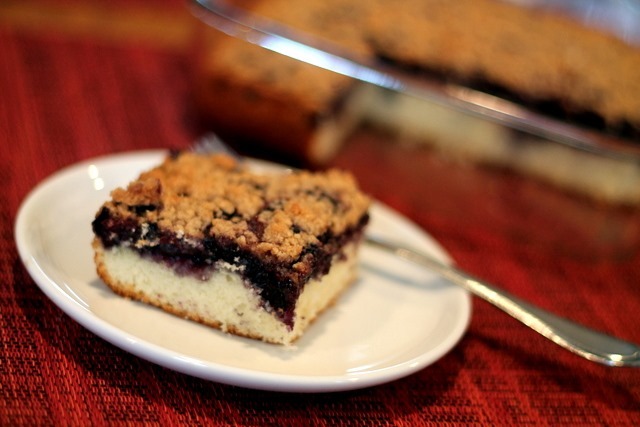 Mmmm that blueberry coffee cake looks yum! I am sending you sleep vibes! That cake ... looks yummy! :) wishing you the best for the next couple of days... Specially a couple hours of sweet dreams! This recipe looks excellent! 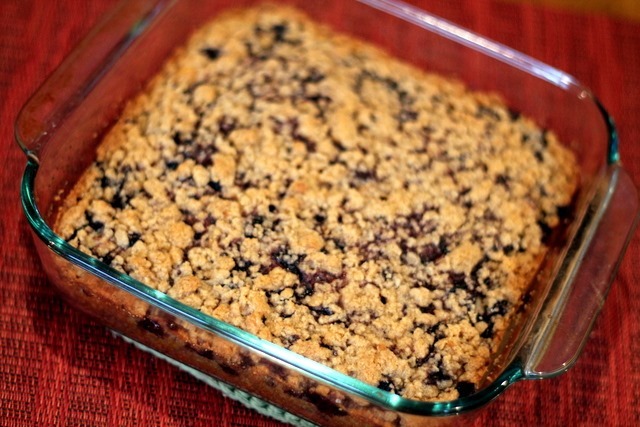 I love all the ingredients and of course, anything with streusel! Looks yummy! I keep seeing similar recipes pop up everywhere so I think its time for me to take the hint and bake the cake! For Lucas, we did something similar with our daughter around four months. Just be patient and try using a sound machine or something that helps generate some noise since he may not be used to a super quiet room. It took us about a week before she got used to it. Good luck! This cake looks SO delicious!!! I love blueberries and coffee cake so the combination together looks awesome! I have never tried wild blueberries but the color is so vibrant! Good luck with the sleep transition! I hope it gets better!! YUM. I love anything with a streusel topping. This is such a great recipe, and seems like it could easily be switched up with another fruit/berry too! Yum! The coffee cake sounds delicious! My dad LOVES blueberry coffee cake, so this immediately made me think of him. :) As for the sleep thing... My tips: 1) Be CONSISTENT! Don't give in. I know it's hard, but trust me. Babies are smarter than you think. 2) Give yourself a week. From everything I've read, it takes about 3-7 days for babies to become accustomed to changes. When we were making the transition from the swing to the crib, I was SO anxious about it. But instead of falling apart about it, I just kept telling myself, the longest this will take is a week. And sure enough, by the third night, he was blissfully sleeping fine. :) Hang in there! I will definitely be looking for Wild Blueberries next time I'm at the store! Good luck with Lucas!! This is one of the many reasons I'm afraid to have kids haha. Yummm that coffee cake looks amazing!! Yum! Good luck with the transition! I cannot wait to try this. I need to pin this recipe when I get home!! Thats looks delicious. Cant wait to try this. Coffee cake is one of my favorite breakfast pastries/sweet by far. 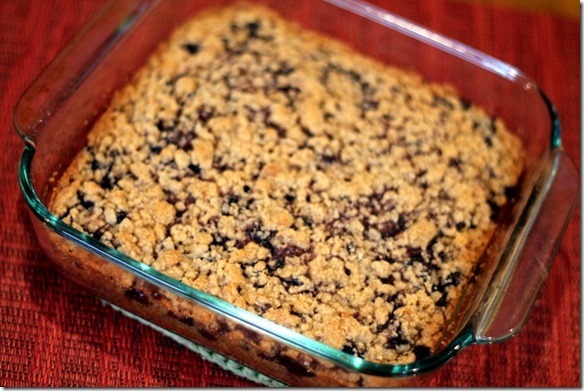 I love that this recipe adds blueberries, yum! Mmm, I could go for some coffee cake right about now. Wishing you all the best this week. Looks really yummy! I promise it'll get better with the crib! I remember how hard that was. oh my.. I love coffee and I love cake. I always love when those 2 words are together :) this looks DELISH. that just sounds/looks SO good right now!! Hugs!!! The transition WILL get easier. My Moms on Call book that I follow always says to allow 3 days for any changes. So hopefully things will be better within a few days!!! Wild blueberries are my favorite! They grow here in Michigan and I'm so lucky to have them right at my camp. We pick for days, but we have lots in the freezer for those winter months! This coffee cake looks amazing! Awww good luck with the sleep transition! I saw one of your instagram posts of Lucas having a little fun with his feet during nap time. It was SO cute. I "awwed" out loud :-) Here's to hoping the transition goes even smoother than you think! PS - as usual, your baked goods look drool-worthy and delicious. 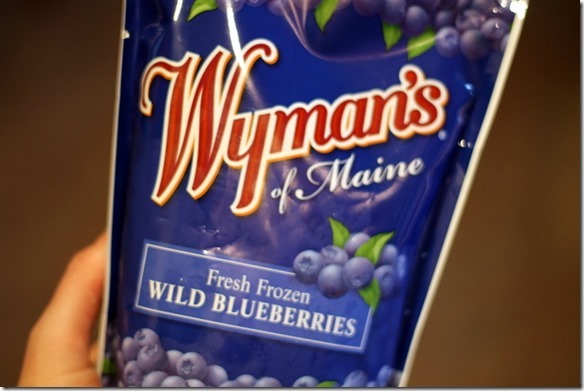 I literally want to go to the store for some wild blueberries RIGHT NOW! This looks fantastic! Coffee cake is one of those foods that always reminds me of my childhood - my mom makes an awesome one! I hope lucas gets used to the sleeping thing soon! good luck! Mmmmmm coffee cake!! This looks tasty! Good luck on the sleep transition….boy is sleep tricky with babies! The coffee cake looks heavenly, I need to make it sometime soon! I can't figure why they call it a coffee cake though......And Lucas's smile is definitely adorable! Hope things are going better with the crib!! That coffee cake looks amazing! can't wait to try it! I LOOOOOVE coffee cake! I can't wait to make this, sounds incredible!!! Made it exactly as written. 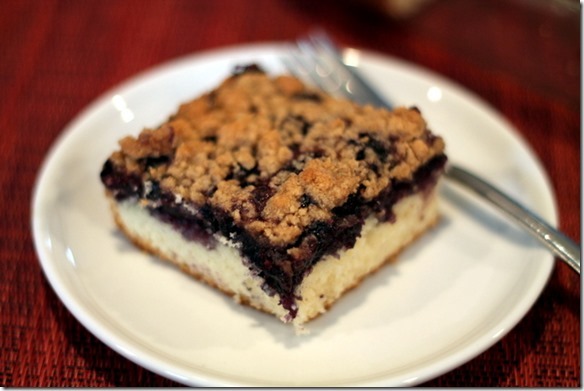 This has got to be the best blueberry coffee cake ever, loved it.